Firewind is a Greek heavy metal band that was originally created as a way for guitarist Gus G. to market his demo album Nocturnal Symphony in 1998. They became a full band over three years later when they recorded Between Heaven and Hell. The band line-up changed between each album until the final change after their fifth, Allegiance. They have recorded three albums with this current line-up, with new singer Apollo Papathanasio (Evil Masquerade). Drummer Mark Cross was succeeded by Michael Ehre (Love.Might.Kill) after recording Days of Defiance. The demo attracted the attention of Leviathan Records, but activity was put on hold when Gus was hired by Dream Evil and Mystic Prophecy. 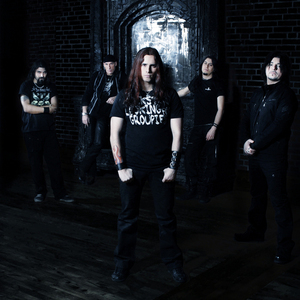 After the release of his other bands' debut albums, Gus' attention returned to the Firewind project. Only he remained from the original formation - Leviathan owner David T. Chastain brought in vocalist Stephen Fredrick and drummer Brian Harris (both ex-KenZiner), while Gus enlisted the help of bassist Konstantine, a fellow Greek. this line-up recorded the debut album Between Heaven and Hell. In 2003, new changes were instituted as Norwegian drummer Stian Kristoffersen and Greek bassist Petros Christo joined the band. Harris and Konstantine had been replaced as Gus was looking for a more permanent rhythm section that was prepared to tour. This line-up recorded Burning Earth and went on a tour of Japan with Rob Rock, but without vocalist Stephen Fredrick, who was not prepared to go on the road (despite prior guarantees to the contrary). His replacement on the Burning the Earth Tour, the Sri Lankan singer Chitral 'Chity' Somapala, was given the job full-time. Fellow touring member Bob Katsionis was also hired permanently to play keyboards. Firewind got a worldwide deal with Century Media by the end of that year. This line-up recorded the album Forged By Fire, but a few months after the release, Chity left due to personal and musical differences with the rest of the band. When his replacement, Apollo Papathanasio of Time Requiem, was found, it was also announced that Stian Kristoffersen would be leaving, to be replaced with the veteran Mark Cross. The reason for the split was that Gus wanted to have a set of Greek-based musicians willing to make Firewind their number one priority (probably to end the virtual revolving door of members) and Stian's main band was the Norwegian outfit Pagan's Mind. Gus also left his roles in Dream Evil, Mystic Prophecy and Nightrage between 2004 and 2006. This new line-up recorded the album Allegiance, which was released in July 2006. During November - December 2006, they toured the UK supporting DragonForce with All That Remains. In 2009, Gus G. became Ozzy Osbourne's guitar player. In 2010 Apollo became the new Spiritual Beggars frontman. In 2010, Michael Ehre replaced drummer Mark Cross.